Blog - What does a security system actually do? 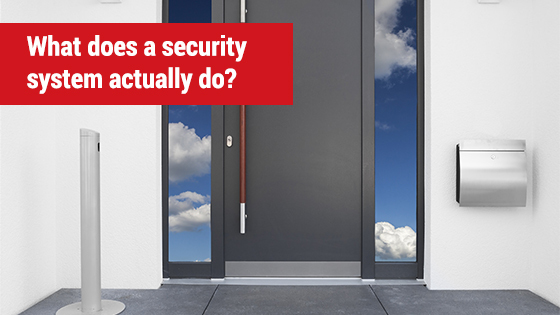 What does a security system actually do? Security systems are now common in most businesses and many residences these days. Despite this, most people are not necessarily aware of what makes up a security system, or how they function. Although even a simple security system is usually made of multiple parts, they are not too complicated to understand at a fundamental level. Firstly, all security systems are connected to a central computer circuit controlling them, known as an alarm control panel. This panel, which is usually accessed through a keypad, allows the owner to control the system, so that they can arm it or disarm it. Furthermore, if an alarm is set off, the signal will be sent to the control panel, where it will often in turn redirect this information to a security monitoring station if Back to Base Monitoring is set up. The monitoring station can then contact emergency services, dispatch security forces to the property, or simply inform the owners that an alarm has been triggered. There are many different types of alarms that can be used to monitor a property. One of the simplest alarms is a magnetic contact breaker, which uses the disruption of a magnetic connection to detect when a door or winder has been opened without the alarm being disarmed. Other common types of alarms include infrared sensors, motion sensors and ultrasonic detectors. These are all effective ways of detecting whether an intruder has entered the property. Alarms aren’t always about preventing crime though. Some security systems will have smoke or heat detectors attached, which can detect the presence or threat of a fire, and alert the fire brigade. A security system can also have triggers for alarms on the property, as well as alerting a security monitoring station. By sounding off bells or sirens, flashing lights or spotlights, a triggered alarm can alert neighbours or people nearby, and scare off criminals in the middle of an attempted intrusion. Security systems are highly customisable, and able to be adapted to a variety of needs. To find out more about security systems in Sydney, talk to the friendly team at Red Handed Security on 1300 13 40 33.